[page 14] Most people see the world like 17th century scientists, assuming that it's possible to have objectivity and to know reality. The new insights of quantum mechanics, in the meantime, have drastically altered the way modern cosmologists view the world -- blasting "objectivity and relativity" into rubble like a condemned high-rise apartment building at the hands of the demolition crew. Through the clearing dust we can see traces of reality hovering as fata morgana above a barren waste, as ephemeral as wisps on the wind, shadows of the mind. Objectivity and reality, existing out there without an observer, have become mere footnotes in the margins of the history of the evolution of consciousness. In the beginning Segal tells the story of a legacy of seventeen camels. The camels were to be divided by three sons into one-half, one-third, and one-ninth parts, an impossibility without the services of a slaughterhouse. But a passing sage loaned the sons the camel he was riding and voila! the problem was solved, the arithmetic worked with the 18th camel included in the calculations. The first son got nine camels, the second got six, and the last got two for a total of seventeen camels. The sage said goodbye and rode off on the 18th camel. "Reality, like the 18th Camel, is needed to become superfluous," von Foerster says. It is required, but only so that we may move beyond it. If you give a five-year-old child five pennies and tell her to make a row between the five on the table and herself, she will do it easily, and when asked which row has more pennies, will say they both have the same number. If you increase the space between one row of the pennies and ask which row has more pennies, the five-year-old child will say "the longer row ." Ask a seven-year-old child the same question and she will look at you funny and say "The same number, of course!" Once a concept is constructed, it is immediately externalized so that it appears to the subject as a perceptually given property of the object and independent of the subject's own mental activity. (1) The tendency for mental activities to become automatized and for their results to be perceived as external to the subject is what leads to the conviction that there is a reality independent of thought. Two such concepts of mathematics and science are the deductive and inductive syllogisms. These logical devices can be used to create necessity and chance. Deductive reasoning creates the illusion of necessity by concluding, "thus it follows necessarily that . . ." Inductive reasoning creates chance by concluding that "thus it follows that shaking a full bottle of soda pop will create bubbles . . ." Von Foerster pointedly asserts that necessity and chance are properties of the observer's logical devices -- not of the systems observed. 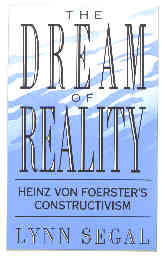 Segal mines von Foerster's thoughts on reality and objectivity for new ways of viewing our experience of the world. He brings into the light of day gems from the nearby precious veins of Gregory Bateson, Ernst von Glaserfeld, Jean Piaget, Paul Watzlawick, Humberto Maturana, Warren McCulloch, and Erwin Schrödinger, who comprised the avante garde of the constructivist wave. With the help of their gems of wisdom, Segal brings us to see reality as a construction of the mind. With that insight the paradigm concept of Thomas Kuhn is obvious: scientists construct a view of reality (paradigm) and defend their creation from assaults at all costs, ignoring anomalies until their entire construction tumbles down like the house of cards it is. The key distinction here is that the usual interpretation of experience is completely reversed. Rather than my experience being a consequence of something outside, i.e., the world, the world is postulated as a consequence of my experience. [page 157] Despite all the remarks about enduring fame and leaving a name behind them that are strewn about in the letters and poems of writers, I had not thought much about writing per se as being a reaction to the fear of death - but once you've got hold of an idea, the proofs of it tend to proliferate. 2. I first read this book in 1986 and the material in it has infused my thoughts and writing ever since. And, as Atwood so cogently points out in (1), "Proofs of it have proliferated ever since."